Matt Adams - Superheroes, Sci-Fi, and a Touch of the Fantastic: How about an actual writing update? I haven't blogged about writing in a long time. The last non-Colts post I did was back in June. There are a couple reasons for that. First of all, I'm a major Indianapolis Colts fan, and I'm using my author website as a place to write about the team. Is it the best venue for that? Probably not, but it's something I enjoy doing. Second of all, I worked myself into a writing slump over the summer. I finished the first draft of THE EXCLUSIVE--a paranormal novel--back in April. After that, I got out of a writing routine as I tried to figure out what to write next. I then visited an elementary classroom in June (see this post for more about that). After talking to my niece and nephew, I decided I'd like to write a book that would be age appropriate for them. I dusted off an old, old manuscript I wrote back in sixth grade and reworked THE ADVENTURES OF THE TAXIS into a middle grade novel. So from April to July, writing was sporadic. You can sense as much from my Facebook updates and tweets. I got into a more steady routine until THE ADVENTURES OF THE TAXIS was finished. I was then faced with the question I hate most: what do I write next? I decided there was a book that had been waiting for a long, long time and needed to get written. It's a ridiculous idea for a novel, but I knew I could have some fun with it. 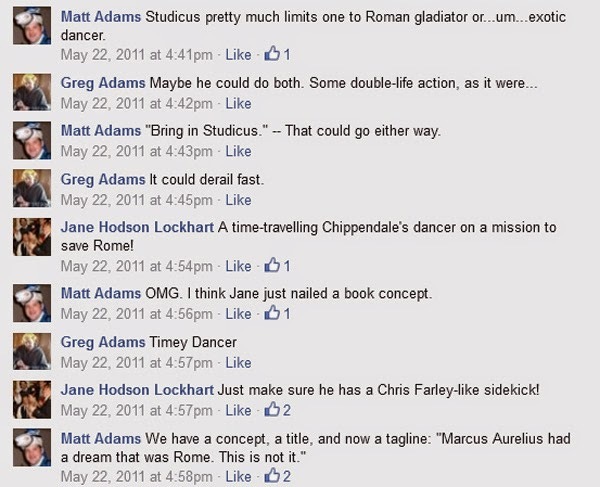 Yeah, that exchange was a thing that happened in a Facebook post in May 2011. Not long after that, I mocked up a cover and wrote a quick blog post about the idea. I've held onto that idea for what feels like forever. I decided in late August/early September that I wanted to write that book. So I did! More than 66,000 words later, I have a first draft that tells the story of Russ "Studicus" Chambers, a male dancer at a dingy club called "Front and Caesar." He ends up going back in time on a mission to save Julius Caesar from being assassinated. Thus, the old tagline--"Marcus Aurelius had a dream that was Rome. This is not it." --is no longer applicable. It just so happened that the intrigue surrounding Julius Caesar's death made for a better backdrop and, I felt, a more familiar setting for readers. 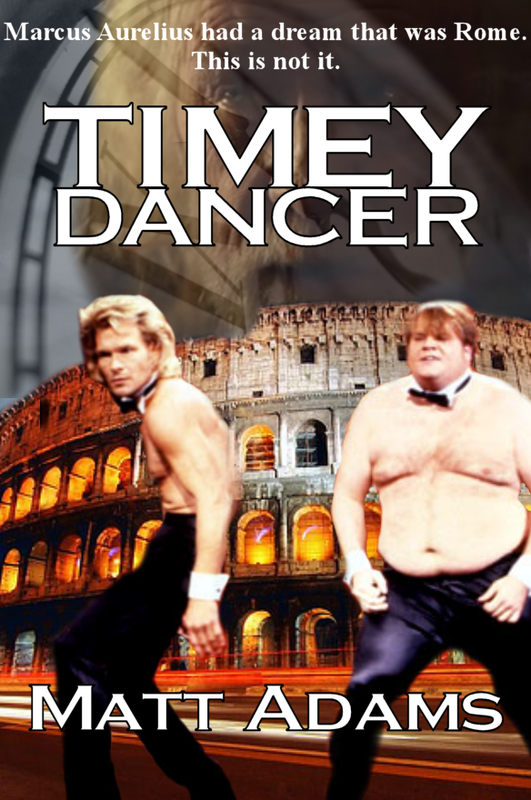 I read a few books on Caesar and Rome, and while my book is in no way historical, at least it's not all completely made up for a book about a time-traveling male stripper who introduces pole dancing to Ancient Rome. So while I have a first draft, the book is nowhere near finished. I've already made dozens of notes and eliminated a character about a quarter of the way into the book so I could consolidate him with another character because they were becoming too similar. Another month or so, and I think I'll have a version of the book that would be fit for a beta reader. 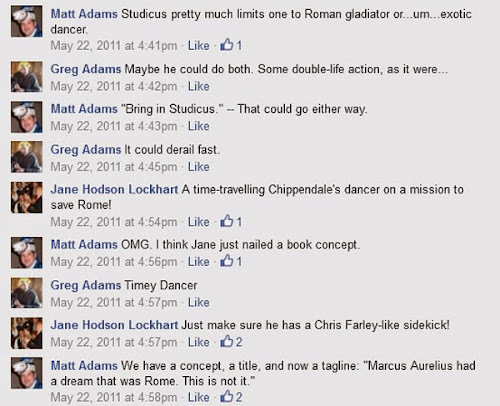 I bet Facebook pals Greg (my brother) and Jane (a friend from school) didn't know we wrote a book together. So, I'm reading through TIMEY DANCER and fixing it. Now I just have to figure out what to write next, which is my least favorite thing ever. So, that's it...a comprehensive update on what I've been writing lately.